Sickle cell disease is an inherited blood disorder that affects more than 90,000 Americans, mostly African-Americans. The condition is caused by a defect in the gene for beta-globin, a component of haemoglobin. Haemoglobin is a protein in red blood cells that carries oxygen throughout the body. The flawed form of beta-globin makes normally round red blood cells become stiff, sticky, and sickle-shaped. These deformed cells can block blood flow, causing severe pain, organ damage, and stroke. Red blood cells are made in the bone marrow from blood stem cells. Some people with sickle cell disease have been successfully treated with blood stem cell transplants. This treatment, however, requires a matched donor and has many risks. A research team led by Drs. Jacob E. Corn at the University of California, Berkeley, Dana Carroll at the University of Utah, and David I. K. Martin at UCSF Benioff Children’s Hospital Oakland set out to use gene-editing techniques to correct the genetic defect responsible for sickle cell disease. The research was supported in part by NIH’s National Institute of General Medical Sciences (NIGMS), National Institute on Alcohol Abuse and Alcoholism (NIAAA), and National Institute of Environmental Health Sciences (NIEHS). Results were published on October 12, 2016, in Science Translational Medicine. The scientists optimized a procedure using the CRISPR/Cas9 gene-editing tool to repair the defective beta-globin gene in blood stem cells from people with sickle cell disease. When the corrected stem cells matured into red blood cells in the laboratory, they had increased levels of normal adult haemoglobin and decreased levels of the sickle form. The researchers next wanted to determine if gene-edited bone marrow cells could remain in a living organism long enough to have therapeutic benefit. Due to the difficulty of obtaining blood stem cells with the beta-globin defect, they injected normal blood stem cells that were gene-edited into mice with suppressed immune systems. They found that an average of 2% of the edited stem cells remained in the bone marrow after 4 months. One mouse maintained more than 6% of the edited stem cells. These levels could potentially be of clinical benefit. 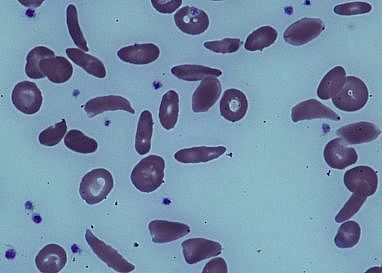 While the methods outlined in the study still need to be improved and scaled up, they demonstrate a potential pathway for developing a gene-editing treatment for sickle cell disease. “It’s very gratifying to see gene-editing technology being brought to practical applications,” Carroll says. This gene-editing approach could also be used to explore ways to treat other blood disorders that are caused by a single mutation.